Put this one in the "We'd feel bad about it if they were mammals" files. With dengue fever infections on the rise and two fifths of the world's population at risk, scientists devise a scent trap that kills pregnant mosquitos. There are dangers to navigating the world using scent. These dangers are multiplied when living in a world in which chemistry has advanced enough to create or mask certain vital scents. When seeking out places to lay their eggs, female mosquitos look for damp areas with decaying matter; which they mostly find in swamps. The eggs remain undisturbed until they breed the next generation of whining bloodsuckers. Recently researchers developed a low-tech device shaped like a trash can and doused with a chemical mixture that smells like the decaying matter which draws pregnant mosquitos in. Inside, the mosquitos land on insecticidal fabric, which kills them and any eggs they've laid. It's a grisly end to the miracle of life, but it has the advantage of being cheap, and of being as specifically targeted as possible. Female mosquitos are the ones that bite, and during pregnancy they're particularly voracious. Not only does the scented trap draw in only female mosquitos, it draws them in at a specific, and high-risk, time. Female mosquitos take in blood before and after laying their eggs. 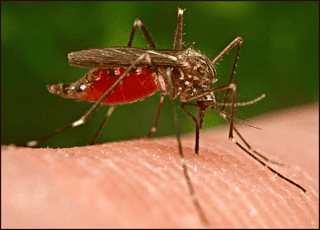 Often, Dengue fever is spread because the mosquitos drew blood from an infected person, laid their eggs, and were still carrying the infected blood when they moved on to the next meal. The trash can trap is small enough to have near humans, which means that when a female mosquito bites a person, she would head to the trap before biting the next human being. Even if someone with dengue gets biten, the disease is not passed on because the mosquito is trapped before it can move on to its next victim. Dengue is no joke. One hundred million people are infected every year, five hundred thousands are hospitalized, and around 2.5% of those hospitalized die. Two fifths of the world is in a dengue infected area, and in some countries it's one of the leading causes of death among children. A bad-smelling trash can could be an easy way to sharply curb the spread of infection. Via Live Science and the World Health Organization.